"Have listened through the tracks and all are absolutely wicked! Will be receiveing full support from me! Bad Tango remix is pure sickness! Will be giving one or more of the tunes a play on my radio show this Tuesday and at my upcoming shows!" "Waoooh! What a first release for the Logariddim label! Welcome to Breaks scene and more!! Support from our Metamorph Masterpieces show in the next weeks and also in our live sets." "I love both mixes but Bad Tango remix is the one for me. I've been playing it in all my sets for a while and it always gets the crowd going. 5/5"
"The release is great... all mixes have something to offer, but I have to choose one to play out and I think it will be the Bad Tango remix. Will be playing it in Manchester tonight..."
"Super strong start here from Logariddim, I really like all mixes. Favourite mix has to go Bad Tango for his sublime synth work." "We are really impressed with both the distinct styles from the artists in this release which really shine through in each track. A really good first release from another exciting new label for 2011." "This is a really good release. If this is your first release, i say kudos to you!" "Fav mix is the Bad Tango one for the tech funk squelchez!" "Massive debut release! Can't really pick a favourite. Full support in my shows and mixes!" "Amazing first release on Logariddim from man himself followed with 3 top remixes. If U continue with releases like this label is going to shout high really quickly. Bad Tango Remix is probably gonna have most plays from me but all tracks are amazing. Great work guys!" "I've been looking forward to the launch of Logariddim ever since it was announced, but seriously, what a way to start! Basically I'll be playing the hell out of all of them... :)"
"I liked all of the release! To summarize, I want to congratulate you, guys, once more and to tell you that you have chose the Right Path! ;)"
"Excuse my language..... f*** amazing, great original and a top top selection of remixes, awesome work guys :D Only problem is which one to play??? If you forced me to pick one it would be the original but that wouldn't do justice to the others!!!" Logariddim co-owner & psybreaks maestro Triple Agent himself, presents us with his new track „Explorer“, a bundle of finest psychedelic techfunk sounds. 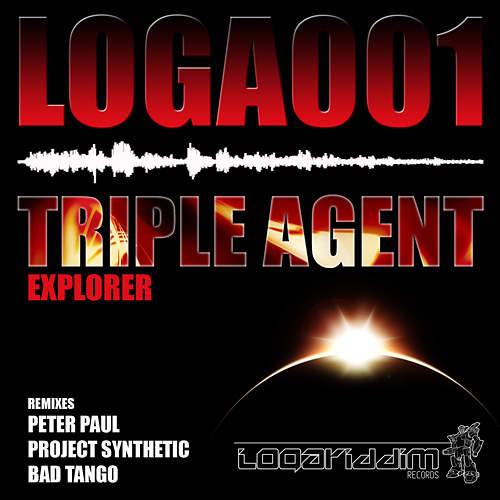 Another twisted squelchy „Explorer“ version comes from UK’s most wanted psybreaks newcomer Bad Tango. His fresh & frisky style takes us to a next level in the psybreaks circus.